Looking for what to do in Chiang Mai? There is an infinate number of brilliant and unique attractions in this city! From amazing city tours, enjoying relaxing massages, shopping at one of the many malls to emersing yourself in local history and culture – Chiang Mai has it all. 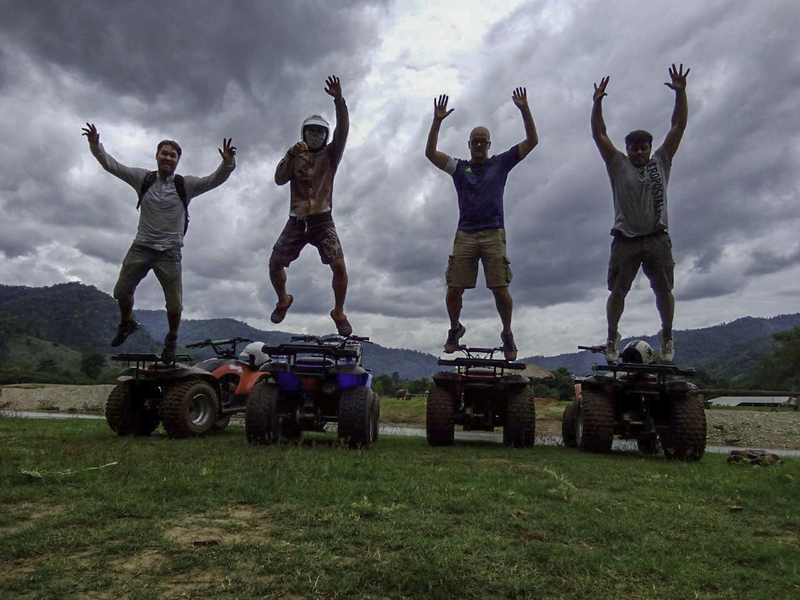 Our what to do in Chiang Mai list comprises of our favourite activities from Outdoors to Temples, food spots for all occasions, as well as night life! 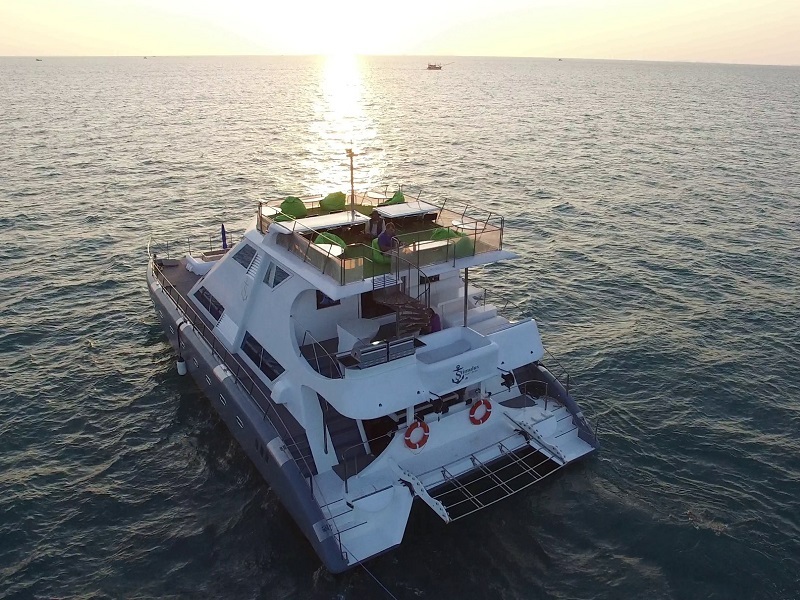 Our recomendations on this page are what we belive to be the best venues and operations in Northern Thailand non of these are paid for recomendations. Please do let us know if you feel there is something missing and we will be sure to go check it out! 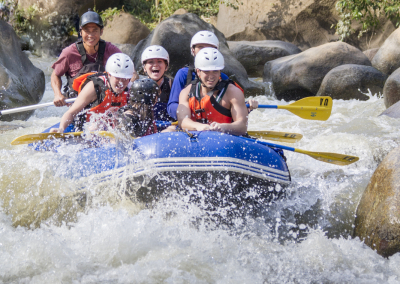 Chiang Mai is a haven for a huge array of outdoor and adventure activities for both the sports enthusiast and families alike. 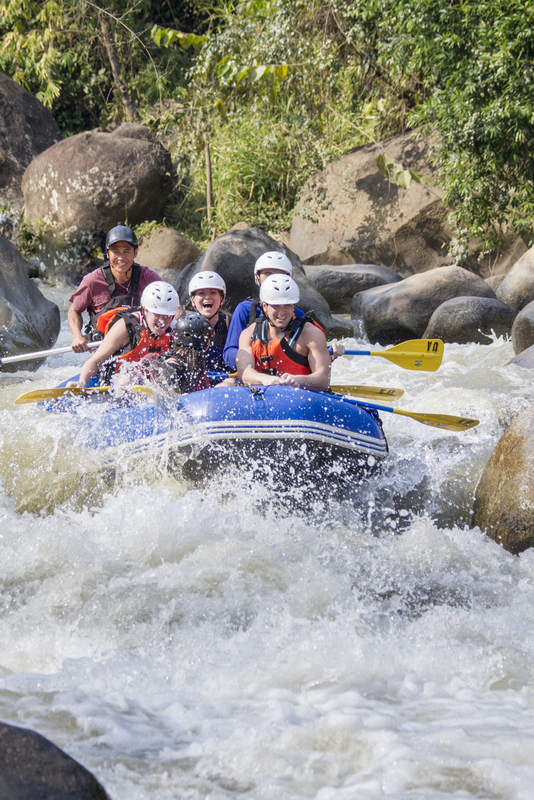 Chiang Mai is in fact home to arguably the best White Water in all of Thailand! 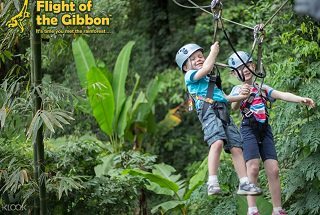 Although this might not come as many peoples first thoughts when thinking about what to do in Chiang Mai, it is a top choice and a much loved activity by all! Elephants are an incredible animal, they are huge yet gentle, they are clever and majestic. Ultimately Elephants are a wild animal and ideally should be left to their own devices in their own habitat. Unfortuantely Thailand’s development, history surrounding elephants and lack of national parks do not allow for this. 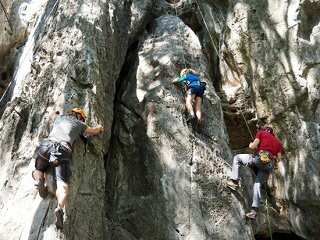 Chiang Mai has some of the best rockclimbing in Northern Thailand and it definitely has the best access to climbing. 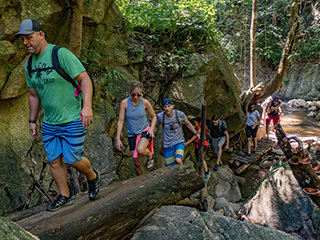 Crazy Horse Butress is a managed rock climbing area over seen by one of the Chiang Mai Rock Climbing Adventures CMRCA and is just 40 minutes from town. You can go with a guide or rent gear. 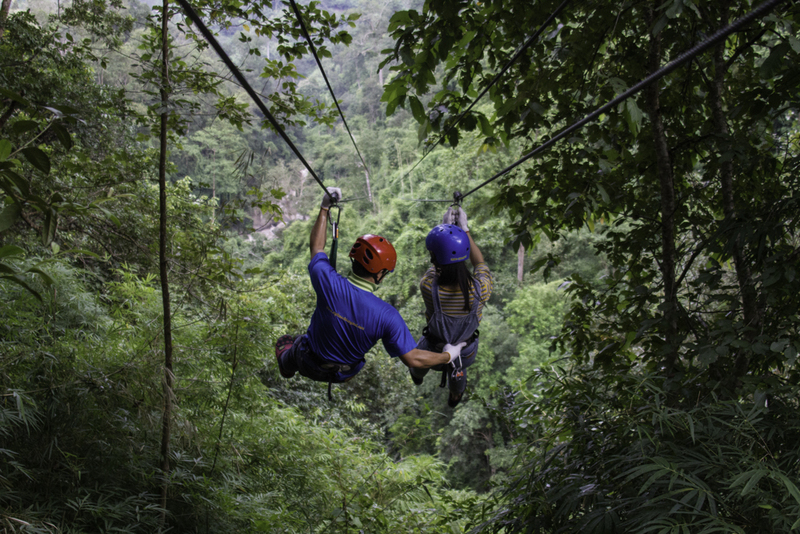 If you haven’t before, going on a Zipline tour is a must! Ziplining is unique as you get to soar through the trees way up in the canopy. 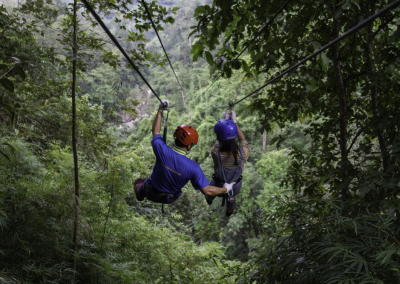 Ziplines are extremely safe provided the operator is experienced – similarly to whitewater rafting, the better the operator, the more they are to charge – do not gamble on your safety whilst on holiday! Hands down a brilliant way to see the sigts of Chiang Mai, recieve a guided tour of some of the cities most famous temples and be introduced to local culture and foods. Cycling around the old city on a guided tour is surprisingly relaxing, easy and cooling especially when compared to walking! 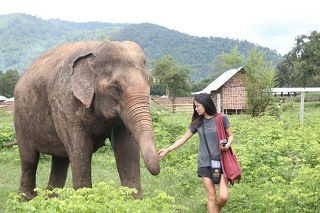 This is the most highly recommended tour to participate in within the city of Chiang Mai itself. Suitable for absolutely everyone. Especially those who don’t think they can cook! Going to a cooking class whilst here in Chiang Mai is a must. Learn the simplicity of Thai cooking and what is involved to creat such mouthwatering masterpeices. There are so many places and so much choice for shopping in Chiang Mai. Even if you’re not looking to buy anything some places are worth visiting just for the experience! Sunday Night Market is a must. If you’re not in Chiang Mai on a Sunday, then the Saturday Night Market is good. There is also an every night night-market (Night Bazzar) which is okay if you can’t make the Saturday or Sunday but the weenkend Markets are better. Warorot Market and China Town are fun to explore if just to experience a local working Thai market. A great attraction inside the city is to go to one of the local artifical rockclimbing walls and practice your climbing skills and get a workout. There are two climbing walls. One of them is at Chaing Mai Rock Climbing Adventures and is a boldering wall along with a great outdoor store and chill seating area. Getting lost is fun and its a part of what travelling to new places is all about. 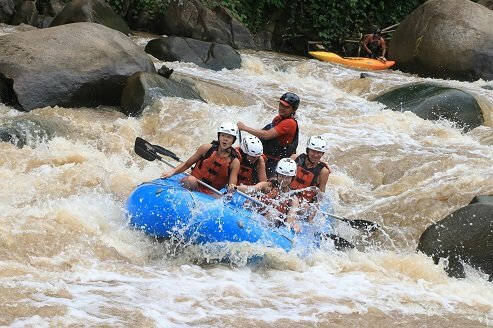 Getting off the beaten track is where you are going to meet and do some of the most memorable things whilst on your holiday. 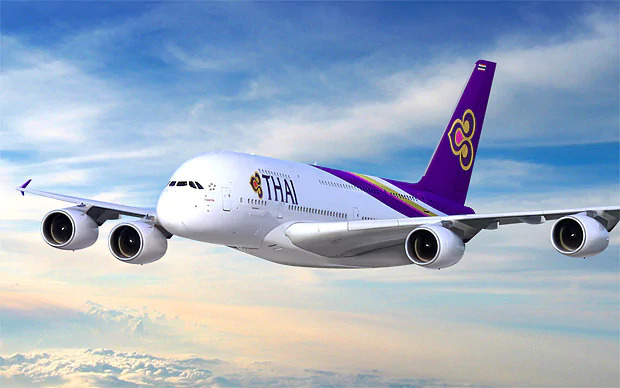 Thailand and Chiang Mai especially, are incredible safe places as long as you keep your wits about you. Don’t be afraid or shy to ask for help if you need to as Thai’s as some of the most friendly, welcoming and helpful people out there! Go for a massage, chat with a monk or just chill at a cafe watchign the world go by for a few hours! What to do in Chiang Mai – Eat, Eat and Eat! From Street food to some of the best rated restaurants in the world. From local Northern Thai food to some of the most delicious burgers and pastas out there. Whilst you’re here in Chiang Mai be sure to try as many as the local, foreign and fusion delicacies available! Brilliant breakfast joint tucked away in the Old City. Located on Moonmuang Soi 5 just a stone throws away from the popular sights of Chiang Mai Old City. Check out their to-die-for French Toast, delicious Breakfast Smoothie or their lunch time specials. Angel’s Secrets combines Thai and Western food in a well done and affordable fusion style. Another breakfast favourite, Food4Thought never ceases to please. Although slightly out of the way, their enormous Omelette’s, creative wraps and paninis as well as their super healthy smoothies Food4Thought totally makes the trip worth it! If you haven’t tried it yes, its a must! Khao Soi is a traditional northern noodle soup with a delicous coconut-based broth. This is a local favourite situated in the popular area of Nimman – open between 11am and 8pm, this restaurant is best visited for a late lunch. This is a personal favourite in Chiang Mai and is my favourite highend Thai choice in town. Ginger successfully manages to combine the delacacies of Thai flavours with a westen finish making it truely palatable and enjoyable for all. If you’re looking for street food, look no further. Highly recommended is the authentic Pad Thai. Come here to find some delicous local food at the very lowest prices you’ll ever see. Packed with young Thai people. Tong Tem Toh is always extremely busy but the wait is always worth it! The menu isn’t in English to ordering sometimes is tricky. The food however you are unlikely to find anywhere else in the world! Real local northern Thai food. Similar to Tong Tem Toh, Huen Muan Jai is an excelent choice for authentic and unique Thai food seldom found outside of this area. Less busy and their menu is in English – come here if you’re looking something slightly less adventerious but equally delicious. Huen Muan Jai is also slightly more ‘up market’ then Tong Tem Toh. Located not to far from the Night Market Antonio’s does some of the best Italian in town. Their Pizzas, Pastas, Starters and Wine List is all brilliant. Very reasibably priced for the quality of food and is our favourite all round Italian in Chiang Mai. Following closely Why Not? is also up there! Located in the heart of Nimman Why Not? has a highly recomendable selection of cheeses, wines and their open wood oven baked pizzas are delicious. Wet Burritos and Margaritas! Miguel’s located a few hundred meters North of Tha Phae Gate is amongst the best Mexican’s in Chiang Mai! Enchiladas and Natchos – Salsa conviently has a few branches to choose from and also has amazingly authentic Mexican food in the city. Centrally located on Nimman, Sushi Umai is the best affordable Sushi in town. Hidden away in CentralFestival, this Japanese is easily some of the most delicious in Thailand. Slightly more expensive than others but certainly worth it! Yummy and reasonably priced Vegetarian food in the heart of the Old City of Chiang Mai! Easily the best Vegetarian food in Chiang Mai – worth a visit even for non-veggies too! My personal favourite Burger joint in Chiang Mai. The bluecheese burget comes highly recommended! Another very good option for the meat lovers of Chiang Mai. Rock Me Burger also has a few locations to choose from which is helpful! This is a decent sports Bar with multiple channels to watch which ever game you’re interested in. A haven for expats in Chiang Mai this Bar has a selection of international draft beers and a fresh bakery too. The UN Irish Pub is rich in history and is very comfortable. Zoe in Yellow is a very popular bar-come-nightclub in the heart of the old city. On a Friday and Saturday night Zoe’s will be packed with young Thai’s and backpackers alike. They boast a large outside seating area as well as multiple bars and dance floors depending on our preference in music. Beer Lab located on Nimman has by far the best selection of international beers in the city. These beers do however come at a premium price. Beer Lab is often busy with affulent Thai’s. Riverside is a very friendly, affordable and good fun resturant-come-bar. The food is traditional Thai and delicious. In the evenings a live band performs a mixture of Thai and Western hits. Drinks are well priced and the view across the river is brilliant. The Jazz Club in Chiang Mai is extremely popular. Live music and cheap drinks brings locals and tourists to this bar every night. Be sure to get there early if you’re hoping to find a seat! Thai people are very friendly and fun! Please be respectful of local customs, remove shoes when entering someone’s house, avoid situations of conflict and keep calm at all times and learn some basic Thai (Hello: Sawadee krup/ ka, Thank you: Khop khun krup/ ka).